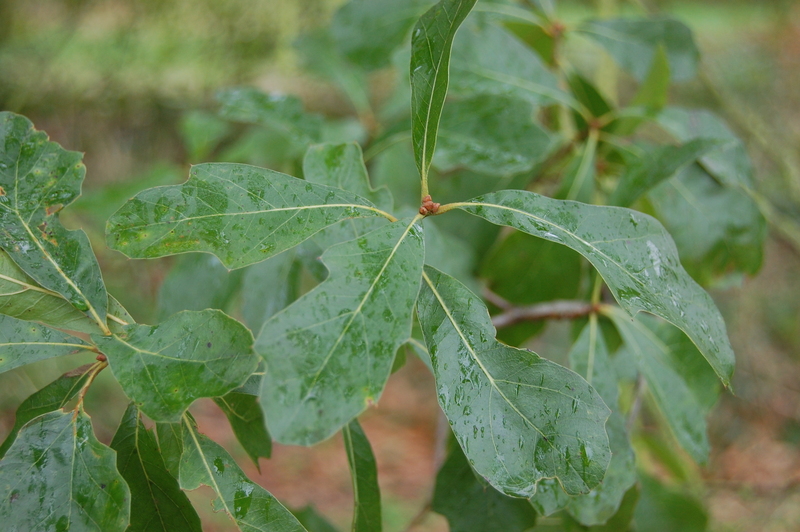 Quercus nigra, the water oak, is an oak in the red oak group (Quercus sect. Lobatae), native to the southeastern United States, from southern Delaware and south to the coastal areas of Maryland, Virginia, the piedmont of North Carolina, all of South Carolina, most of Georgia (with the exception of the Appalachian Mountains), all of Alabama, Mississippi, central Florida, and westward to Louisiana and eastern Texas. From there, northward to southeastern Missouri including Arkansas, eastern Oklahoma, parts of Tennessee, and extreme southwestern Kentucky. It occurs in lowlands and up to 450 m (1500 ft) altitude. It is a medium-sized deciduous tree, growing to 30 m (100 ft) tall with a trunk up to 1 m (3 ft) in diameter. Young trees have a smooth, brown bark that becomes gray-black with rough scaly ridges as the tree matures. The leaves are alternate, simple and tardily deciduous, only falling well into winter; they are 3–12 cm (1–5 in) long and 2–6 cm (1/2–2 in) broad, variable in shape, most commonly shaped like a spatula being broad and rounded at the top and narrow and wedged at the base. The margins vary usually being smooth to shallowly lobed, with a bristle at the apex and lobe tips. The tree is easy to identify by the leaves, which have a lobe that looks as if a drop of water is hanging from the end of the leaf. The top of each leaf is a dull green to bluish green and the bottom is a paler bluish-green. On the bottom portion of the leaves, rusty colored hairs run along the veins. The acorns are arranged singly or in pairs, 10–14 mm (1/3-1/2 in) long and broad, with a shallow cupule; they mature about 18 months after pollination in fall of second year.